The 1952 Goodwood Nine Hours motor race in Boy's Own paper. Homepage. This page: Boy's Own magazine features sports cars in 1925, 1953, and 1958 issues. The May 1925 issue of Boy's Own. 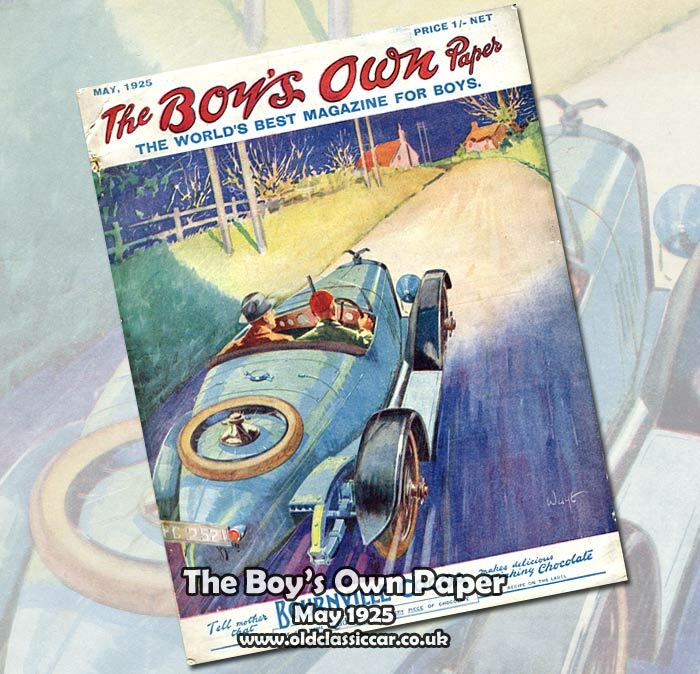 In 2013 an early copy of The Boy's Own Paper (The World's Best Magazine For Boys) turned up, with a stunning, motoring-related, cover illustration. Dating from May 1925, the full-colour illustration portrays two chaps speeding along in their boat-tailed sporting machine, its powerful headlamps doing a fine job of illuminating the otherwise dark road ahead. This 1920s copy is noticeably larger in its dimensions, similar in size to a magazine, than the '53 edition featured further down this page. The remainder of this one shilling (5p) publication is given over to a variety of worthwhile pursuits, all designed to stretch the mind of their reader. Subjects such as stamp collecting, building a stereoscopic photograph viewer, lawn tennis, butterfly collecting, advice on choosing a career, in addition to a number of other fictional stories, were guaranteed to keep young minds occupied for many an hour. 2. 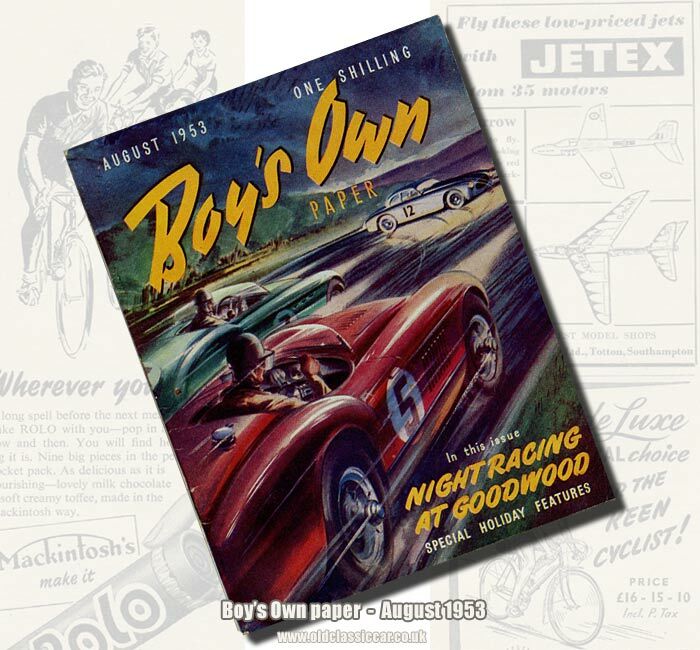 Boy's Own features the Goodwood 9 Hours race, in a 1953 copy. The Boy's Own paper was one of several children's comics, magazines and newspapers that could be relied upon to feature motor racing scenes on their covers, and/or articles, on a reasonably regular basis, and the August 1953 edition is no exception. 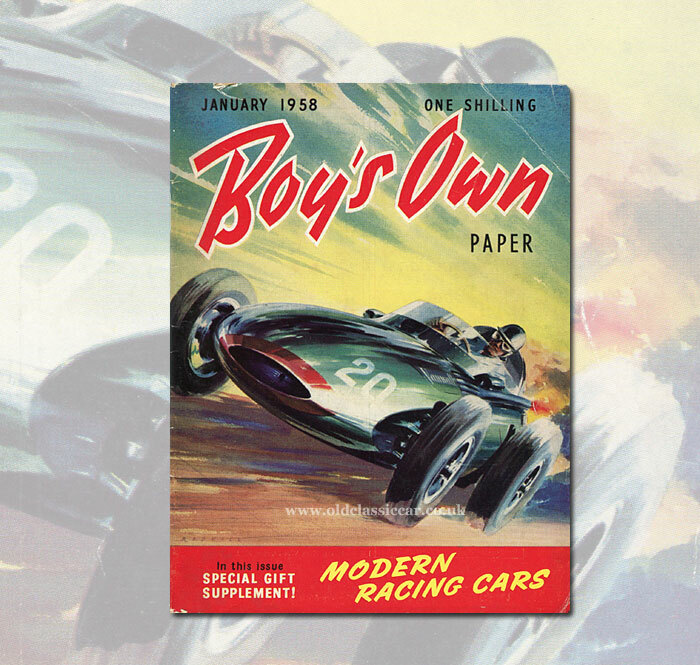 This issue of Boy's Own features a brilliant image, portraying three racing sportscars battling wheel-to-wheel during the first of the famous Nine Hours races at Goodwood. The article, titled "Night Racing at Goodwood", introduces the reader to long-distance sports-car racing, from the early years where cars and machines competed in city-to-city events, such as the Paris to Bordeaux road race, through to the Double Twelve meetings held at Brooklands in the 1930s, and of course the most famous of them all, Le Mans. The report of the inaugural Nine Hours in 1952 followed, as a precursor to the upcoming meeting for 1953. The Nine Hours sports-car event at Goodwood commenced at 3pm and continued until midnight. In order to host the event, a great deal of work was undertaken to the pit area, and marker posts, fitted with red reflectors, were installed around the perimeter of the track, to aid weary racing drivers during the hours of darkness. Extra lighting, and emergency generators, were also acquired prior to the first of these meetings. Thirty cars lined up to take the start, their drivers performing a "Le Mans" start by sprinting from the opposite side of the track, leaping into their steeds, before firing up their engines, engaging first gear, and streaking off down to Madgwick, the first corner at the Goodwood circuit. Accompanying the article is a photograph of Stirling Moss, and an image of Duncan Hamilton, Roy Salvadori and John Coombs tackling the clockwise circuit. Car 39, an HRG, is shown in the pits undertaking a pitstop. A spectator's account of the exciting race tells the story of the action as darkness fell on the Sussex circuit, where XK120 "C" Jaguars battled with Aston Martins and Ferraris, to uphold the British honour. One of the Astons goes up in smoke during a routine pitstop, three mechanics are burnt and the car is left looking decidedly the worse for its conflagration. Abecassis' Aston suffers gearbox woes, leaving the Jaguars out front, the sole remaining Aston of Collins following in their wake, keeping the Ferraris at bay. Positions changed throughout the remainder of the race, thanks to mechanical gremlins and plucky drives from the teams of drivers. Collins and Whitehead, sharing the remaining Aston, took the chequered flag. The 1953 race took place on August 22nd, with the final staging of this nocturnal event occurring in 1955, when the Aston Martin DB3S of Poore and Walker crossed the line in first position. The remainder of this issue is packed with inspiring ideas to satisfy the most curious of children. Articles discuss how to go about forming a nature club for instance, a reminder of how children were once encouraged to play outside, climb trees and get their hands dirty. Tips on sailing are also given, as are ideas on how to make hot days more comfortable for the family pet. Young aeromodellers would have been delighted to stumble across a feature starting on page 26, where ideas for control-line model aircraft are discussed, and a full-page advertisement a few pages on describes the range of Keil Kraft model kits that were available. Jetex model aircraft also receive a mention. Another article unlikely to be found in a boy's book or magazine today, takes a look at cigarettes, and describes how scientific experiments can be undertaken at home on your father's cigarettes, to analyse the smoke produced by them. Much more wholesome and healthy were the references to cycling, in both articles and in many of the advertisements presented within this copy of Boy's Own. Machines by James, Phillips, and Royal Enfield are advertised, in addition to cycling accessories by firms such as Lucas, Terry's, Miller and Brooks. 3. Boy's Own January 1958. To 1958 now, and another copy of the magazine with a motoring theme to its cover. Here, a thundering Vanwall Grand Prix car relates to a special racing car supplement that accompanies this issue. Happily the pull-out supplement survives, but first is an article in the main magazine about driver Ricardo Rodriguez, on page 5. The 15-year old driver was causing observers to take note of his obvious talents, thanks to successes in 1.5 litre US sports-car races at the time. His technique is described as "a mixture of Fangio-skill and Moss-dash with a little South American rhythm thrown in". 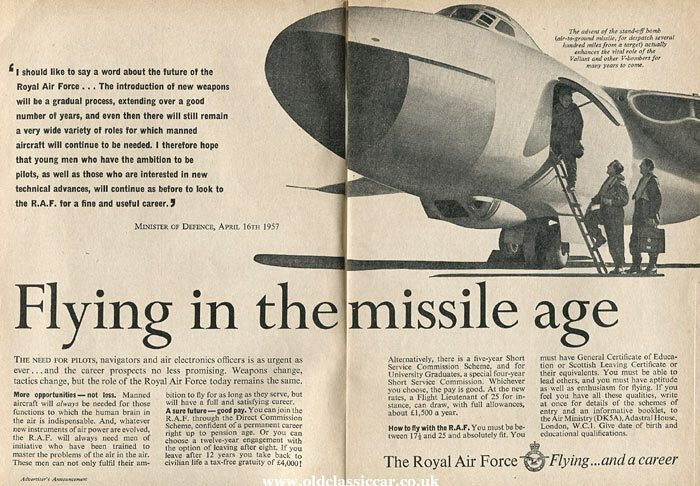 Prior to the Rodriguez article is an eye-catching, two-page, recruitment ad for the Royal Air Force, illustrated by a Vickers Valiant V-Bomber. The single-colour supplement folds out to create a small poster, illustrated with drawings of famous British racing cars of the era. These include beauties such as the Aston Martin DBR1, the Jaguar D-Type, a Cooper Formula 3 car at speed, and MG's EX181 speed record car driven by Moss at the Utah Salt Flats. A quick review of Italian competition cars, and a be-finned Porsche shown with a similarly-adorned Indy car driven by Sam Hanks to victory in 1957, occupy the reverse side of the sheet. The remainder of the Paper has little to do with motoring, although it is packed with brain-expanding articles and features, all designed to fascinate and intrigue the younger mind. In the days before home computing, and hundreds of TV channels to choose from, it was often books and magazines that youngsters turned to for inspiration. A number of other children's publications (comics, newspapers etc) with a motoring theme to them, can also be found on the main Motoring Collectables page.